Factual error: A girl is playing with a Tamagotchi virtual pet in the scene set in 1994, but the toy was not released in Japan until 1996 (it wasn't officially available in the USA until May 1997). Factual error: In the beginning of the movie when they are in the hotel room they are drinking Killian's beer. However, the label on the Killian's bottle was a new style label. When the movie was supposedly shot the Killlian's would have had the old style label. Factual error: Notice at the beginning of the movie when they are loading their stuff, you see a 1997 or above Ford F-150 truck sitting at the house across the street. The movie takes place in 1994. Factual error: During the scene in the supermarket, Mike holds up a PowerBar to the camera, but the flavor, Oatmeal Raisin, wasn't introduced until 1996, two years after the documentary was supposed to have been filmed. Continuity mistake: When Heather first picks up the bundle of sticks she carries them to the river. 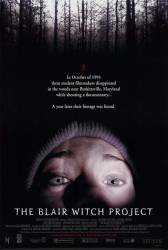 During this she steps over a log on the ground and if you look closely you can see the black bag containing the guy's teeth fall out but when Heather opens up the bundle it is still there. She couldn't have put it back herself. Factual error: I don't remember when it occurs, but you hear the sound of cicadas in the woods- this was supposed to take place in October. The last cicadas sound off in early september, during the warm weather. Factual error: During the scene when the two guys are fishing, the guy on the right is using a bait casting rod, you can tell by the finger grip where the reel connects to the pole. The problem is, the rod is equipped with a spinning reel. A spinning rod has no finger grip. Heather Donahue: I just want to apologize to Josh's mom, and Mike's mom, and my mom. I am so sorry! Because it was my fault. I was the one who brought them here. I was the one that said "keep going south." I was the one who said that we were not lost. It was my fault, because it was my project. I am so scared! I don't know what's out there. We are going to die out here! I am so scared! There are 133 F-words in this movie.